Jeff Lemire: I had a really interesting conversation with [Marvel Editor-in-Chief] Axel Alonso when he called to offer me the book. At first, it didn’t seem like something that I was really interested in. It wasn’t until I had a really good conversation with him and explained his take on the character and what that book could be that I really started to see the potential. OH HEY LOOK NEBULA SUDDENLY LOOKS LIKE SHE DOES IN GUARDIANS OF THE GALAXY. WHAT A COINCIDENCE. And a storyline revolving around how Thanos is dying. Which is nigh-pointless since Marvel's not going to kill him off while there's still one drop of sweet synergy juices they can flense out of him. To be fair, Nebula has looked at least fairly close to the movie version pretty much ever since the Infinity Gauntlet series. Considering his penchant for heavy Photorefs, I'd have liked it if Deodato had modelled Thane on Matt Smith and Starfox on Arthur Darvill. I am a little confused. Why doesn't he have time? Couldn't he just step out of time or whatever? First with Thanos and now Kingpin why are they making covers to make these long-trending villains seem more innocent. Well, to be fair, the cover to issue one has Thanos standing over a mountain of skulls. Which of the Kingpin covers has him look innocent? The upcoming one with the girl and the red balloon. Yeah but that has him holding a guy he presumably beat up/killed by the collar as well. It's supposed to indicate his public image and who he really is. It's kind of been a thing for Thanos, remember that time he retired to become a farmer? I dunno if that's as benign as it first seems. Thanos has this habit of regarding butterflies as snacks. Don't be fooled, that butterfly's flapping up a storm that kills thousands on the other side of the country. Mentor's an Earth Eternal, so shouldn't that be the equivalent of stubbing his toe for him? I'd have thought so, but given his powers, it might depend how disruptive in terms of matter and energy this iteration of Thanos is, I suppose. Should be. I have a vague memory that he was a badasss warrior when young too. An elder earth eternal should at least be able to make a weakened Thanos work a bit, especially given Thanos later performance. Then again, after examining his son so thoroughly, Mentor probably knows if he has any chance in a fight, and may just chose to take a dive. He may think that will make Thanos simply leave, without endangering the staff further. 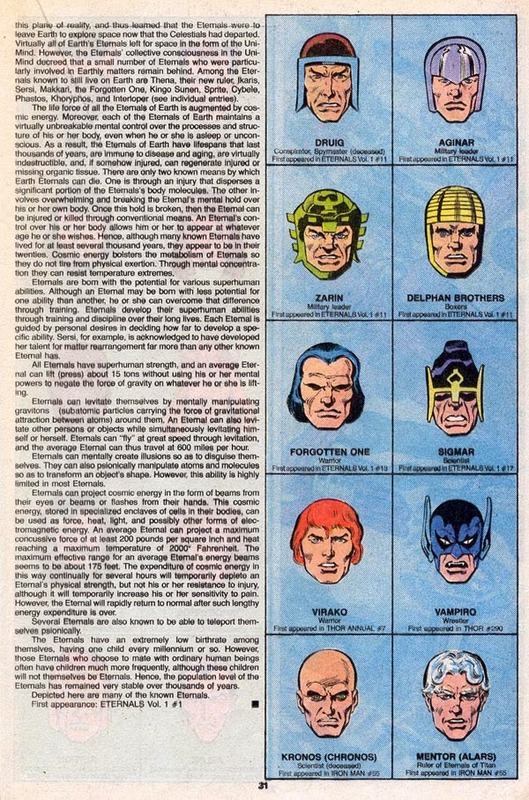 The Antartic base of the Eternals is fully functional again, as I remember, so he'll be active on earth before Thanos leaves orbit anyway. Basically, no, eviscerating Mentor would not kill him. Annoy him, yes. Set him back a little, sure. But not kill him. I do enjoy this. I liked how, last issue, the Champion just blew off Eros pretensions to decadence. He is after all an elder of the universe, with little patience for the pretensions of lesser immortals. I also like how similar Eros and Thane comes across here. Just a little in facial features, but much the same in attitude and body language. Similar demeanor is what I'm thinking. However, I am getting a feeling here that the writer does not realize that Titan is a real place.